Components of the drive train. The drive train is a group of parts that collectively form the mechanism that propels the cycle forward. The components include pedals, the chain set, the chain, the bottom bracket and the derailleur gear system (on a cycle with more than one gear). 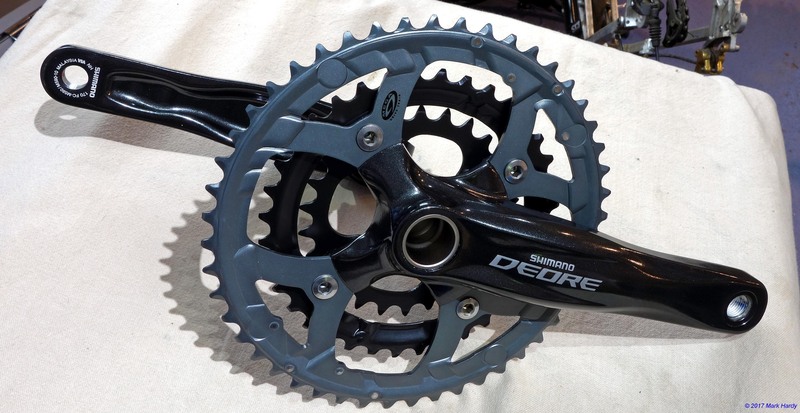 The chainset consists of chain rings, crank arms and sometimes, bottom bracket bearings. The term groupset is often used loosely to describe the drive train and refers to the gear system plus brakes. A complete groupset from one manufacturer such as Shimano or SRAM means that there is a compatible quality standard of all parts throughout the drive train. Although many entry level factory model cycles will often feature a mixture of branded parts to make up the groupset, this is usually done in order to build a cycle to a price. 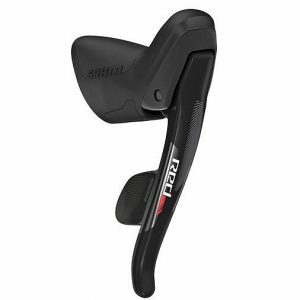 For new riders, this makes little difference to the experience of riding the cycle. Professional and experienced amateur riders often demand the higher quality more precise and more positive action that a matching brand groupset brings. 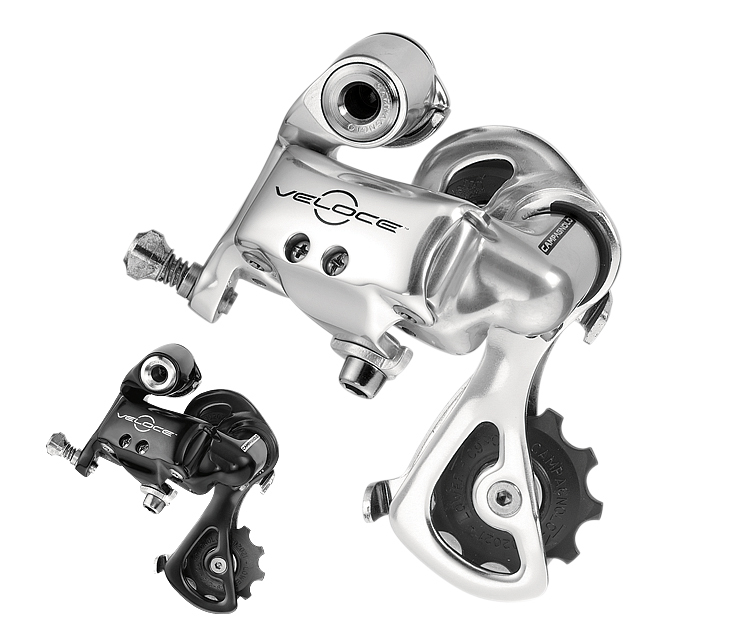 The Italian manufacturer Campagnolo have taken a step further and ensured that their gear system components are only compatible with other Campagnolo components. 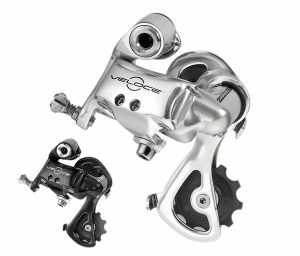 Currently, the higher quality groupset models for road bikes of the three major brands Shimano, SRAM and Campagnolo, are the Shimano Dura Ace, SRAM Red and Campagnolo Super Record. They are of comparable quality. At the entry level sector of the market the Shimano Claris groupset is much more common on entry level road bikes than the SRAM Apex and Campagnolo Veloce budget groupsets. This is due mainly to the price of the Claris with regards to building a road bike to a budget price. How the components of the drive train work together. The drive train derailleur gear system can be visualised as follows. The front gear shifter operating the rear mech does so by tensioning or relaxing the cable. A tensioned cable pulls the spring loaded rear mech against its spring tension, and the chain travelling between the two arms of the rear mech cage is nudged to a lower gear (larger sprocket). Relaxing the cable at the shifter results in the rear mech relaxing the tension of its spring and the cage nudges the chain to a higher gear (smaller sproket). The relaxed (home) position of the rear mech is in top gear on the cassette. The front gear shifter operating the front derailleur or front mech operates in a similar way by tensioning or relaxing the cable tension for the front mech cage to nudge the chain from one chain ring to the adjacent one. All of this occurs during pedalling and forward motion of the cycle. Most modern gear systems are designed to operate correctly whilst the cycle is being pedalled and moving forward. Earlier traditional gear systems based on hub gears such as Sturmey Archer, and the modern Shimano Nexus hub gear system still operate the traditional gear selection requiring freewheeling whilst changing gear.